So God loved the world, that he gave his only-begotten Son, to the end that all that believe in him should not perish, but have everlasting life. Saint Stephen’s Choir of Men & Boys continues a tradition which stretches back to the early days of the church. More particularly, it is heir to a choral legacy, dating back to the Middle Ages, which is one of the glories of the Western Church. The Choir regularly performs works by Byrd, Purcell, Mozart, Mendelssohn, Vaughan Williams, and Britten, just to name a few. The Choir sings most Sundays during the academic year, and occasionally during the summer. On the 1st Sunday of the month at 6 PM, the full Choir sings Evensong, a contemplative service drawn from the ancient Offices of Vespers and Compline, and it is the crown jewel of the Anglican choral tradition. Check the Evensong page for information on upcoming services of Evensong or Lessons & Carols. The full Choir sings Choral Mattins at the 11 AM service on 2nd, 3rd, 4th and 5th Sundays. The Choir also sings services for certain major Feasts and Fasts, such as Christmas Eve, Ash Wednesday, Maundy Thursday, Good Friday, and the Easter Vigil. The Gentlemen of the Choir sing a plainchant Eucharist at the 9:15 AM service on 3rd Sundays. For more details, see the Choir’s home page, and check our blog for the latest announcements. You may also sign up for the Choir’s mailing list. And if your son is home-schooled, consider enrollment in the choir as an opportunity for a solid education with an internationally respected curriculum. 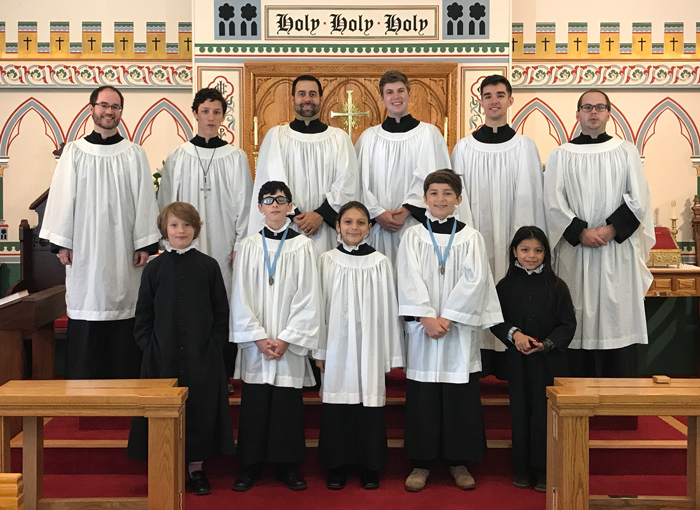 Saint Stephen’s Choir of Men & Boys is composed of boys aged 8 through 18 and an ensemble of professional adult male vocalists. The trebles (boy sopranos) are drawn from the Saint Stephen’s Choir Academy, a choir school founded to foster the artistic and intellectual development of boys, and to continue the tradition of English choral music. The choir is under the direction of Adric Macsisak, a graduate of the Peabody Conservatory with over 25 years’ experience training boys’ voices. Choir Academy tuition is subsidised by scholarships. As such, the choirboys receive an extensive classical music education at no cost to their families. Additionally, each chorister receives a monthly stipend, underscoring his professional commitment to rehearsals and performances. The stipend is incremented as he progresses to each new level of musical proficiency. Any boy who enjoys singing and wishes to receive a classical music education is encouraged to apply. Membership in the Saint Stephen’s Choir Academy is open to boys of all faiths. Prospective choristers, ages 7 to 12, are welcomed at any time of the year. Consideration is also given to older boys whose voices have not yet broken, particularly those with some singing experience. To schedule an interview, please contact the Admissions Director, Mrs Cheryl Nickol on (410) 329–6399 or at admissions@choiracademy.org. The history of men and boys choirs is, in many ways, the history of the Anglican Church. Originally, women were not in choirs because choristers were a minor clerical order from which women were excluded. As the centuries passed, the sense of such choirs being an honored tradition took over as the technical prohibitions against women singing in the choirs became, thankfully, unimportant. In this country (particularly in the Episcopal Church), vested male choirs became more and more the norm as the nineteenth century came to an end, and the zenith of the tradition was probably in the 1920’s and 30’s. Nowadays, such choirs are increasingly viewed as anachronistic. And yet so much of the music written for the Anglican communion over the centuries was written with this type of choir in mind, and still sounds best when sung by such a group. Many churches cannot support a choir of men and boys, and many others would find such a choir an affectation. Nevertheless, it is hoped that the tradition will never die out completely, and that the great music of the Church will continue to be sung by that sort of choir for which so much of it was originally intended.